Online retailer Master of Malt announces the release of four new Single Malt Scotch Whiskies from That Boutique-y Whisky Company. All are bottled without age-statements and feature cult comic book style labels that reference various stories and in-jokes associated with the distilleries and the people connected to them. The second instalment of whiskies from That Boutique-y Whisky Company has now been released – these whiskies hail from the Speyside distilleries of BenRiach, Aberlour, Aultmore and Benrinnes. All are bottled without age statements and feature cult comic book style labels that reference various stories and in-jokes associated with the distilleries and the people connected to them. That Boutique-y Whisky Company was launched in September 2012 as the latest independent bottling label from Master of Malt. That Boutique-y Whisky Company bottles Single Malt Scotch Whiskies in the truest sense of the term, meaning that they are a blend of casks from a single distillery. They are labelled without age statements to demonstrate that the flavour of the whisky is more important than its age. Also, remember to keep hold of your old bottles because you might just be able to play spot-the-difference with later batches – that's if you look very carefully! 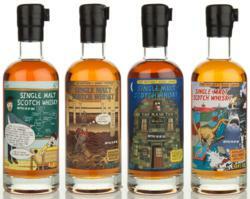 The new releases from That Boutique-y Whisky Company are now available from Master of Malt here. Nose: Raisins and dried apple lead to cox apples, cloudy apple juice, ground ginger and roast cocoa beans with maybe the slightest hint of smoke. Palate: Rich, fruity and mouth-filling, with additional notes of ginger, barley and bitter dark chocolate. Finish: The finish is substantial and well-rounded with burnt dry fruits, autumnal berries, Pink Lady apples and brandy cream flavours. Nose: Vanilla oak notes, followed by lemon zest and greengages. As the whisky opens up intense notes of cloves and lime zest reveal themselves. Palate: The palate is layered with mixed spices, sweetened with creamy vanilla, and highlighted with notes of greengages and citrus peels. Finish: The finish lingers with refreshing menthol, deep dark chocolate and tingling white pepper. Nose: Big fruity cherries, marmalade, a hint of red vermouth followed by subtle toffee and old leather. Then, just out of reach, is a little bit of peat just to remind you of BenRiach's other personality. Palate: Red cherries, strawberry coulis leading to floral heather and a (very small) pinch of peat. Finish: The finish is soft and gentle with a sugar syrup quality flecked with strawberries and raspberries with the briefest suggestion of crushed black pepper. Nose: A fat aroma of stewing peaches and lychees dominates the nose with side notes of a just opened packet of juicy sultanas and moist fruit cake. Positively enchanting! Palate: Silky and oily with reduced tropical fruit juices, fireworks, grape juice and a sprinkling of cinnamon and nutmeg. Finish: Lingering firework smoke, rhubarb, passion fruit and peaches in a full-bodied and fruity finish. Master of Malt is one of the UK’s leading Online Whisky & Spirit Merchants, with a huge range of whiskies, rum, brandies, gins, cocktails and many other fine spirits.